The Finished hunt test duplicates actual hunting conditions found throughout the country. 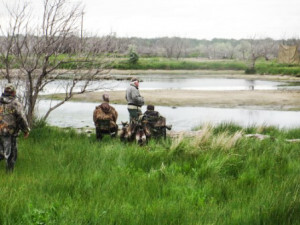 The successful completion of these tests leads to the qualification of a hunting retriever for the title of Hunting Retriever Champion, (HRCH). 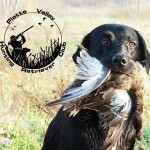 To pass these hunting tests the Finished Hunting Retriever must accomplish the tasks required with both style and accuracy. Judges will look for natural ability and a trained performance. The Finished Hunting Retriever must respond promptly to either voice or whistle commands and remain steady and under control at all times. The Finished Hunting Retriever should be a pleasure to hunt with under any conditions. In finished anything goes! Not quite, but these dogs have to be able to handle complex marks and control situations, as well as heavy suction to old marks, etc. Usually triple marks will be seen. Diversions may come on the way out or the way back from a mark. There will be at least one honor (i.e. your dog is to sit quietly off-leash on or near the line while another dog retrieves.) The judge may require retrieves of marks or blinds in a prescribed order. In upland tests the dog must be steady to wing and shot and must honor if required. The dog must be very steady and handle crisply and cleanly. Gun handling is required, just in the Seasoned test. Maximum distances for marks is 150 yards on land and 125 yards on water. Blinds can be up to 100 yards.